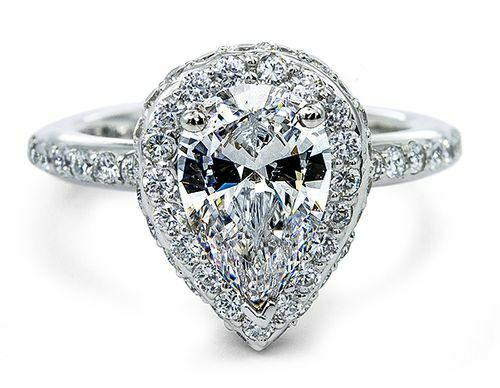 The Erika 3 Carat Pear Cubic Zirconia Pave Set Halo Eternity Solitaire Engagement Ring features a prong set 3 carat 12x8mm pear center stone along with a halo of pave set rounds as well as the shank of the ring. 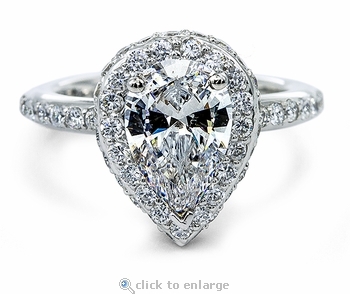 The 3 carat pear diamond look center stone is prong set in a raised fashion by two overlapping rows of pave set round cubic zirconia stones. 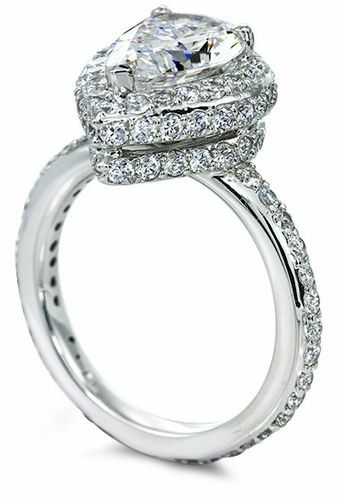 Additional pave set rounds enhance every surface of the shank in an eternity style band. The elegant band is approximately 2.75mm in width and includes approximately 5.5 carats in total carat weight. This ring is offered in solid 14k white gold in a finger size 8. The Erika Ring is also offered on the regular part of our site, please see item R1533. For further assistance, please contact us directly at 1-866-942-6663 or visit us via live chat and speak with a knowledgeable representative.